You are here: Home / Family Living / Household Hacks / How To Buy In Bulk And Save! In our house now and especially when we had 4 kids (and all of their friends) at home we worked hard to save money on groceries in every way we could. 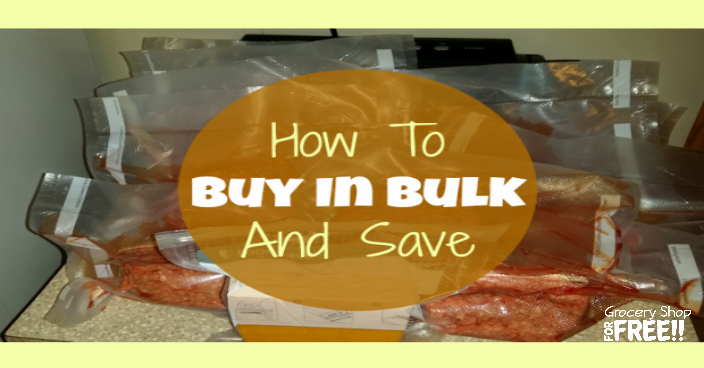 We learned quick How To Buy In Bulk And Save! We freeze a lot of things from vegetables to milk to meat. You can see my list of 21 Grocery Items You Can Freeze here. We also buy in bulk when we can. Even with just 4 people in the house we still buy in bulk and save as much as possible and one of the ways we save is to make sure we preserve what we buy in bulk in the best ways. With only 4 people in the house now things could go bad quickly since we cook large meals like we did before. We use Foodsaver products to preserve our food. We recently had to change deep freezers and I found a good bit of meat was ruined because I had stored it in regular freezer bags. What ways do you save on groceries? Since it’s just my husband and I now, I don’t usually buy in bulk much, but I’ve been thinking about using the food saver method for leftovers, I have not mastered the cooking small portions thing yet. I’ll give it a try, thanks! I totally understand and I like it to save my cheese, cause it can go bad and veggies: tomatoes, onions (don’t leave an odor), and so forth. I bet you’ll enjoy having it. I now a lot of people use it for their flour and beans to keep them bug free (if you have that issue). We are also a family of 4 and buy in bulk. Certain items are definitely cheaper and have a good shelf life, such as rice and toilet paper.